Triple Tail have been referred to as a bream (bluegill) on steroids. These fish average three to four pounds, but are regularly seen and caught up to twelve and sometimes twenty pounds. In early Spring, these fish can be found floating off of Jekyll Island. Some say they are spawning and some say they are just warming in the sun. In any case it provides a unique sight fishery that is enjoyed by more and more people. It can be crowded on the weekend, so fishing during the week is suggested. Most anglers target these fish with live shrimp fished under a popping cork. Personally, I enjoy the challenge of fishing for them with a fly. But I always enjoy the challenges of salt water fly fishing. To find Triple Tail, you simply idle around in front of Jekyll looking for what looks like a white trash bag floating in the water. Make sure the sun is high and the sky clear. Keep the sun at your back, look closely at the back side of swells. The fly fisherman has to get closer to these fish than the popping cork/bait fisherman, so after a fish is spotted, I lower the trolling motor and use it to get within casting range of the fish. Cast a lightly weighted, small shrimp imitation in front of the fish,(the Prawn's Revenge is a great fly) and make sure to strip it slowly in front of the fish. The fish will sink out of sight, and your line goes tight. The Triple Tail takes off on a long run, usually making a few jumps along the way. Then the fight turns into a tug of war. These fish can be really finicky. If you find the fish follows and rejects the fly, change it. Sometimes the fish simply will not eat, but it is still exciting chasing them. These fish will also respond to a Gurgler or a popper/dropper combo. Take care if you are fishing a popper/dropper combo. The long casts and wind can result in a fouled fly and knots in your leader. Remember, this is fishing and some days the fish aren't there and on others you have shots at dozens. Keep trying, keep going, keep your eyes open, change flies and keep trying. Fly fishing for Triple Tail is not the easiest thing to do;and when you are successful, give yourself a big pat on the back. Come, "Hunt Fish in the Marshes of Glynn"
Ater the first day battling high winds, murky water and crowded fishing we began the second day of the trip a little less than optimistic. After poling about a mile along a bank that usually holds fish, we bumped a big school. After the fish know you are there, catching them becomes problematic. We watched where the fish in the bumped school headed, gave them a little time to calm down and followed them down the bank. They came to a large oyster bar, and settled down. We carefully approached where the school was, saw some movement, and Howard cast to it. After a five minute battle, we brought the fish to the boat, took a few pictures and released the red to fight another day. With the skunk off the boat, we ended the day with three nice red fish to the boat. It was a great day with two great people. There is a new video of fishing for red fish in the grass. Check it out. Steve came to St. Simons for a week. 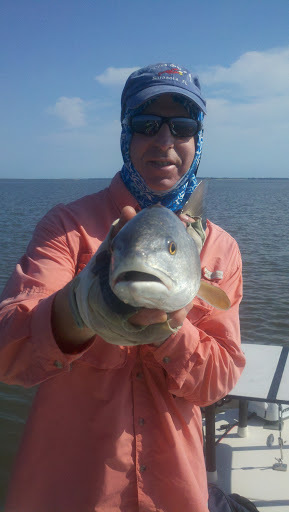 He and his wife fished with me, and Steve caught his first red fish ever. We also had a great time exploring the Dunes of Cumberland Island and watching the wild horses grazing in the salt marsh. 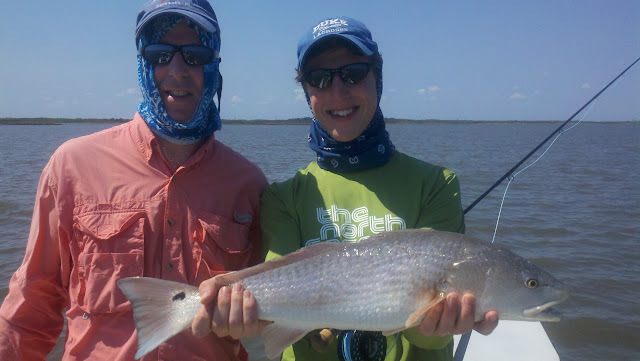 One of the best parts of guiding is introducing people to the sport of sight fishing for red fish. We have just finished the winter that never was. January and early February fishing was off the charts. Go to myYou tube channel to view the video of late January fishing if you haven't seen it: Two Guides Take a Holiday. It shows the big schools of red fish we have in St. Simons duringthe winter. January came and went, and the first part of February fished similarly. Then the WINDS started to blow. It seemed the winds of March came early this year. Fly fishing in 20 knot winds is not fun. "Good morning David! Saturday was a long and grueling day of fighting the wind and cold. Fished from 9 - 4:30 and only managed one fish but being my first it was well worth it! Thought I would share and say thanks for all of the advice you have so willingly shared!" Will was successful that day, but his comments summarize the fishing in late February and early March. By mid-March stable weather returned to SSI. We have had highs in the 80's and the water is already up to 70 degrees. Our spring/summer patterns typically have light winds from the SW in the morning, which become still until the Southeast Sea Breeze kicks in. This means great fishing in the morning! I love early morning and mid day low tides. 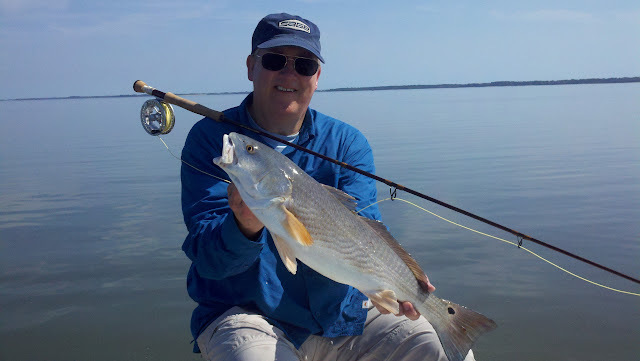 The water can be glassy smooth, and you can see the red fish moving from fifty yards away. 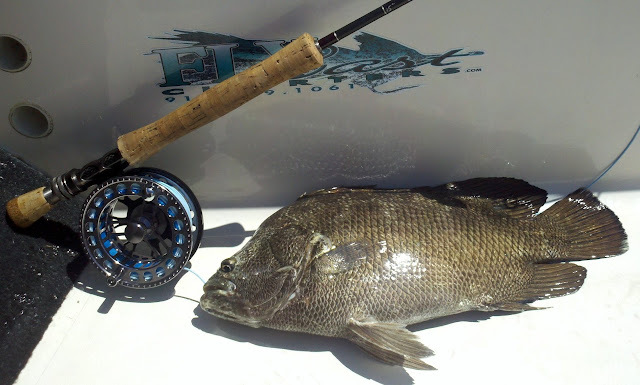 On the neap tides, the water is fairly clear and the sight fishing can be great. I had the opportunity to fish with another family team last week. Howard is an experienced salt water angler. His son Joey had never been salt water fly fishing, but he is a good caster. I was excited to have them on board. The first day we faced stiff winds and only managed three small trout. On the second day, the red fish gods smiled. We found these fish in less than twelve inches of water. You could see them finning and tailing from 50 yards away. They were soooo spooky. I bet we had almost 100 shots at fish. We actually had more success when we found a school in slightly murky water and cast to the school. Regardless, a Father and Son sharing a few days of fishing is about as good as it gets. A great trip this time of year is combining red fishing on the low tide and chasing Triple Tail before or after the tide. Triple Tail fishing is sight fishing at its best. Trout fishing is picking up and the Trout are showing up off Cumberland and up the rivers. A few of these make a wonderful meal. Since the water is so warm so early this year, I expect we will have tailing fish in the grass by mid April. I will keep you all posted on when this exciting fishing begins. 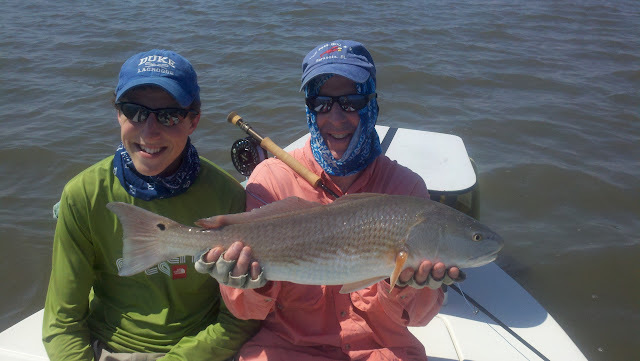 If you want to experience a unique fishing trip for Triple Tail and red fish, give me a call today to book a trip during April and May, enjoy our mild weather and come "Hunt Fish in The Marshes of Glynn." When you are in the Golden Isles, make sure you visit St. Simons Outfitters, the Orvis store in St. Simons and the ony fly shop on the coast between Beaufort, SC and Jacksonville FL. Capt. Larry always keeps an excellent selection of local flies that are producing fish.